At Gainesville First, we love to hear and share stories of struggles overcome, dreams achieved, and lives transformed. Your willingness to share what God has done in your life is an act of praise, and it could make a huge impact on someone else's faith journey! 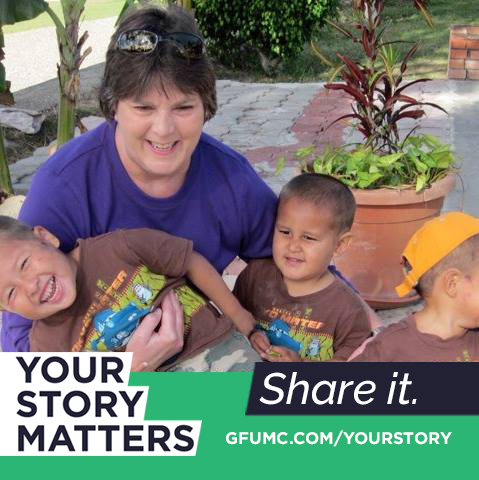 Your story matters, share it! “I’ve had the privilege of watching my older brother, Russ, discover the true meaning of God’s grace as he’s traveled the road to sobriety. Now his life is a modern day resurrection story. However in order for me to share the resurrection story with you, I must tell you the death story. Since his childhood he has battled addiction. It began with huffing glue even before he was a teenager and ended with meth till he was 49 years old. The continual cycle of hopelessness surrounding addiction is hard to understand unless you have lived it or witnessed it. Being his sister was like having a front row seat to a horror movie…watching someone I love slowly destroy his life. Over many years faithful GFUMC friends have prayed for him even when I couldn’t muster the strength and faith to pray one more prayer. Then when things were as bad as they’ve ever been, just short of death itself, miraculously, he left his old life behind and started the journey to a new life. Now my brother at 51 years old isn’t just surviving, he is thriving. A growing man in Christ with a brand new start. In just over a year he has met his Savior, publicly declared himself a follower of Christ through baptism and is now leading other men to Jesus at Miracle Hill Overcomers Center in Greenville, South Carolina. He now has a strong community of believers that encourage and hold him accountable, and you will often find him reading the Bible and books that grow and strengthen his faith and leadership skills. He also has a gentleness to his demeanor that is ever present even in the face of adversity and difficulty. He, in so many ways, is a new person, still my brother of course but now the core of who he is, his overriding personality and behavior, is a reflection of the grace that saved his life. “I love Chapel Worship at Gainesville First! Not only is the Chapel gorgeous, with the colorful and majestic art in the stained glass windows shining bright, the service is a great spiritual blending of the traditional and contemporary services. The inspiring music is a mixture of hymns and contemporary Christian songs that fills my soul. Also, with an intimate crowd of around 100 people, Chapel Worship really feels like a church family. Small group study, opportunities to serve and be served, and cherished relationships nurtured at Gainesville First make the Good News of the Gospel come alive for me. Local and global outreach and service brings me such joy and grounds my faith.